There are several recent developments in the Dracénie Provence Verdon (DPV) agglomeration in south-eastern France that involve natural gas vehicles (NGVs). Frédéric Decompte, Director of Transport of DPVA, said the changes stem from moves to encourage bidding companies to renew their fleets with cleaner vehicles. “In the context of the revival of the markets in September 2018, we made the choice to encourage […] these vehicles that will circulate in the 23 municipalities of the agglomeration”, Decompte declared. He added the changes were within the framework of a territorial policy of sustainable development in order to preserve the environment. While DPV operates the urban network with eleven buses, it has entrusted the rest of the services to the Beltrame Group by public contract. “We now own more than 270 bus-buses, 60 of which are dedicated to the city. With this order, it will be more than 80% of the fleet circulating on Dracénie that will run on natural gas,” said Anthony Beltrame, CEO of the Group. DPV is also working to renew its bus fleet with NGVs and to adopt a multi-year investment plan with the acquisition of two buses per year over three fiscal years. In April, six IVECO Crossway Low Entry Natural Power, elected “Sustainable Bus of the Year 2018”, will be delivered. They will be the first to circulate in France. In total, there are 80 vehicles that the Beltrame Group will incorporate into its fleet, including four Daily Blue Power NPs that will be assigned to the city and transport on demand. In order to supply the entire fleet, the Beltrame Group, in association with Pizzorno, will install a CNG station which will also be able to supply CNG trucks in the region. With four 315-liter cylinders integrated into the roof design, the Crossway LE NP and Crossway NP allow up to 600 kilometers of range, with fast or slow filling choices. Equipped with the CURSOR 9 NP engine, manufactured in the Bourbon-Lancy plant in Saône-et-Loire, they also offer the same power, 360 hp, and the same torque, 265 kW, as their diesel counterpart. The Crossway NP offers the lowest total cost of ownership in its class. With its Cursor engine and gas fuel, maintenance intervals are extended by more than 50% compared to a diesel vehicle. IVECO BUS also offers maintenance contracts dedicated to natural gas coach buses. Specific training modules, dedicated spaces and trained dealers are able to meet the needs of operators throughout the country. The Natural Power range is respectful of natural resources since it is 100% compatible with biomethane (renewable natural gas), resulting from the recovery of organic waste. The environmental benefit is then manifested by a 95% reduction in greenhouse gases. “We are particularly proud of this 37 Crossway NP order, the first of its importance in France. 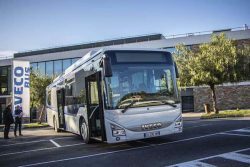 It proves once again the leadership of IVECO BUS in the field of alternative energy vehicles that will help meet the energy transition law”, says Brice Bonavia, Managing Director IVECO France. IVECO BUS is a brand of CNH Industrial NV.